I'm not going to pretend I know everything about growing hops, but like everything else brewing related, I want to mark it off the list of things to try in this hobby. Looking around my house for somewhere decent to plant them was not promising. 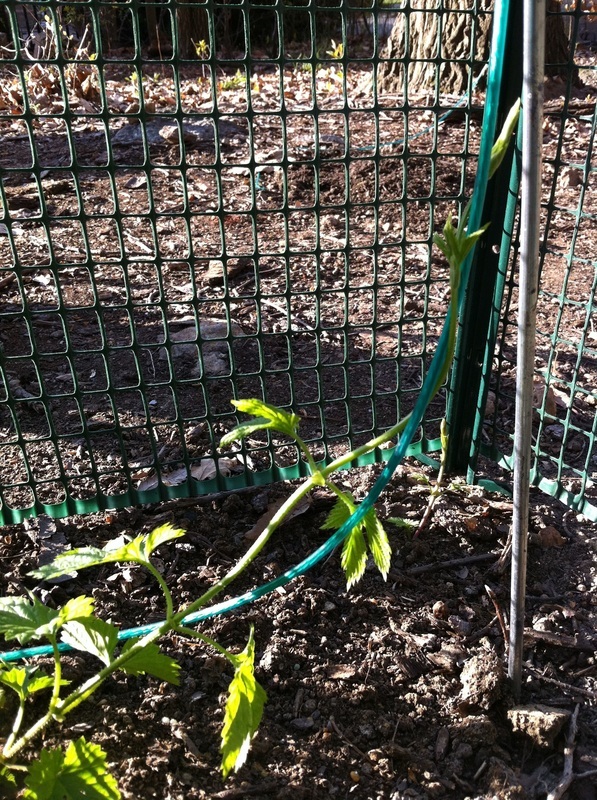 Hops need at least 6-8 hours of sun a day, so the south-facing side of the home is ideal. The only place I could find was at the woods edge behind our house which is partly shaded and gets around 4-5 hours a day. 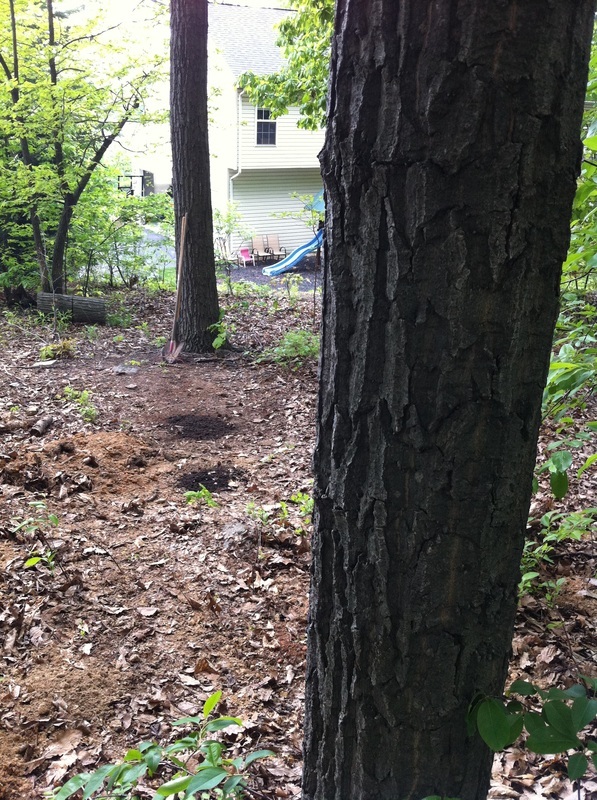 There were two trees relatively close to each other that could work well. 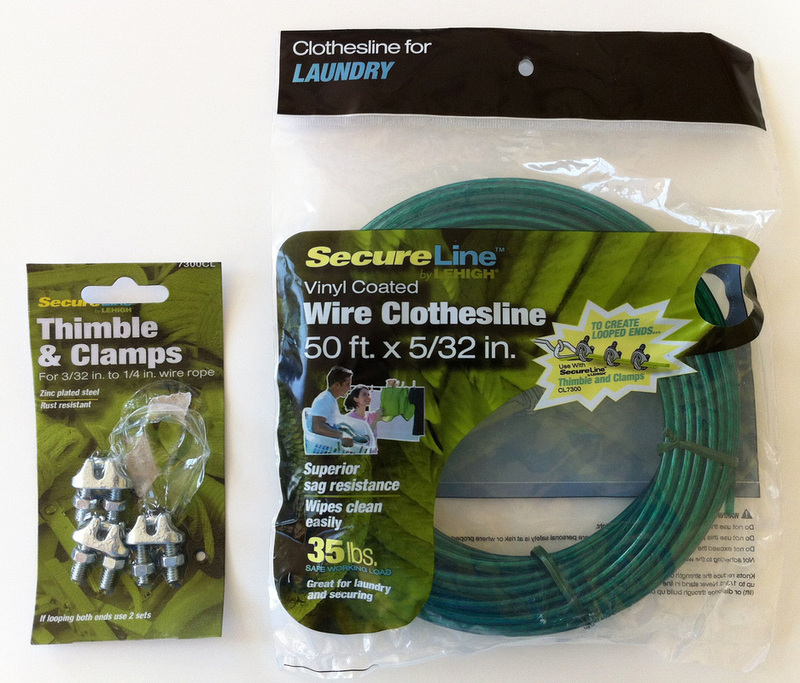 After reading a bit online about different ways to secure the hops, I came up with a pretty cheap solution to use clothesline kits from an all-purpose store like Walmart. The kind I bought had a small steel braided cable with green plastic casing and a few pieces of hardware for the end pieces. Since I bought a few packs, I had enough parts to run a cable from tree to tree and four more that hang down for each plant. 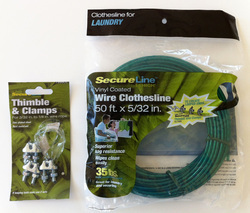 The clothes line and clamps. I think we used 3 or 4 packs of each for this project. 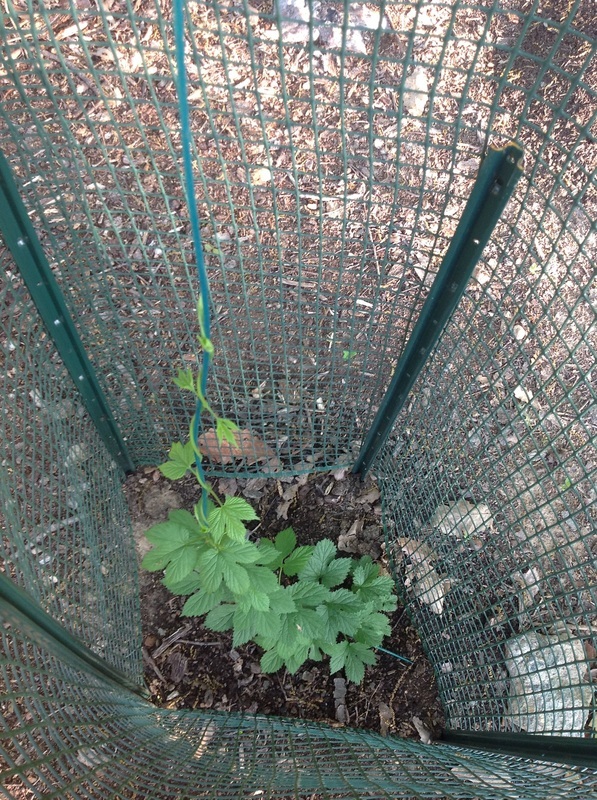 Hops grow very fast and can get as tall as 25 feet (7m), although most are closer to 18-20 feet (5.5-6.1m) at their maximum height. The bines grow vertically, winding around their support system in a clockwise direction following the sun. There are many ways you can support the bines. 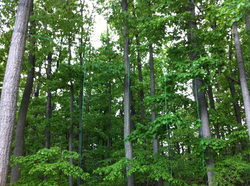 I've seen people use poles, trellises, or twine hanging down from the roof of their house. 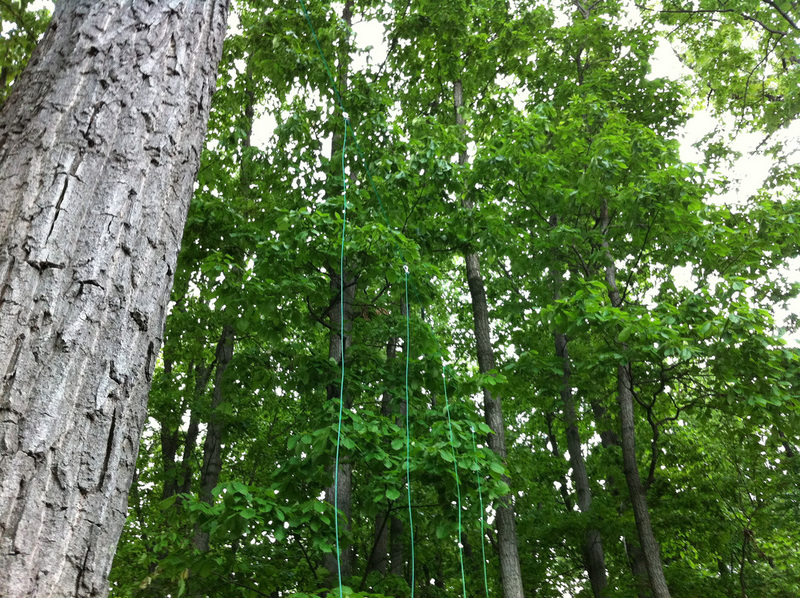 I decided on a clothes line method because it should last a long time and I could secure it high enough. 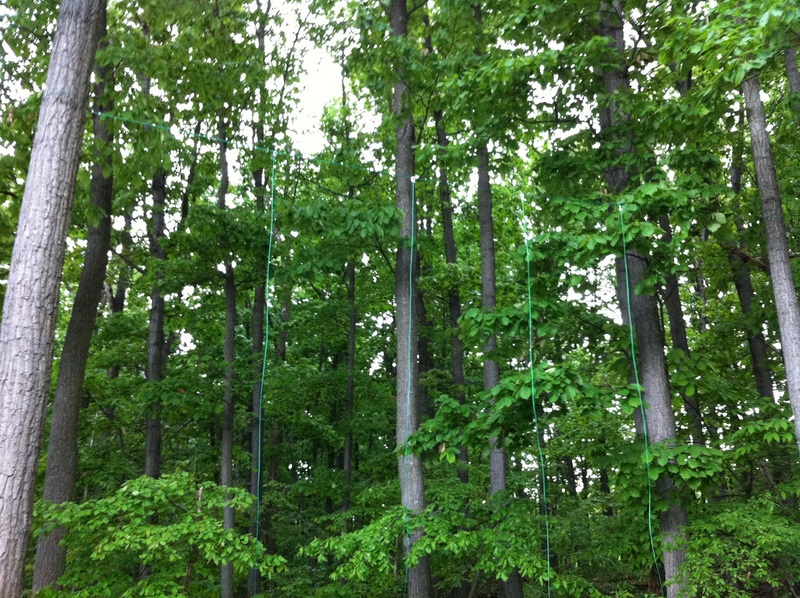 It's probably hard to see (click the pic for a larger image), the lines are secured to each tree at exactly 20 feet. It was actually a bit scarier up there than I had imagined! 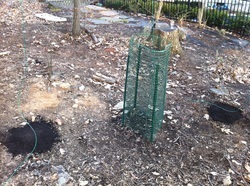 All four planting locations have a line hanging down for the plant to attach its hairs. 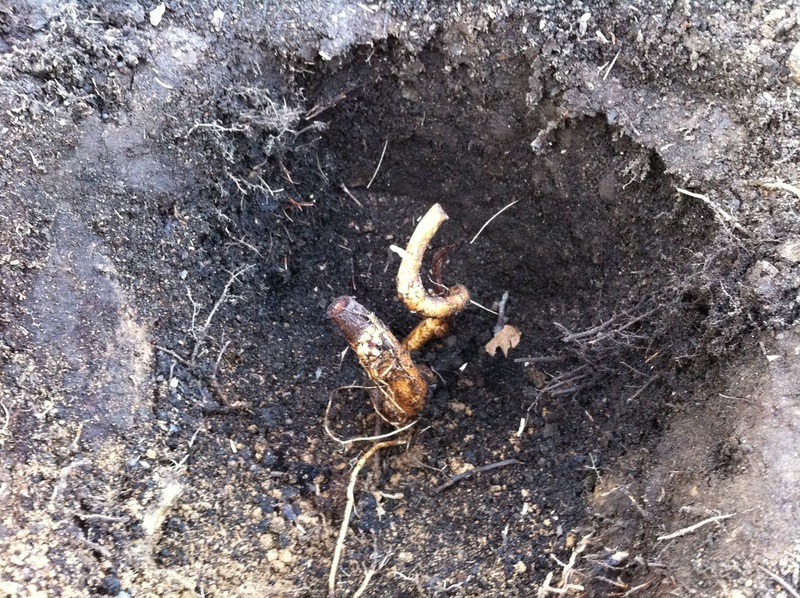 We planted two small root sections, called rhizomes, of the mature female hop plant (the cascade variety). 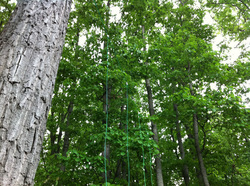 The far plant did not sprout, but the closer one did, climbing to around 15 feet in it's first season. 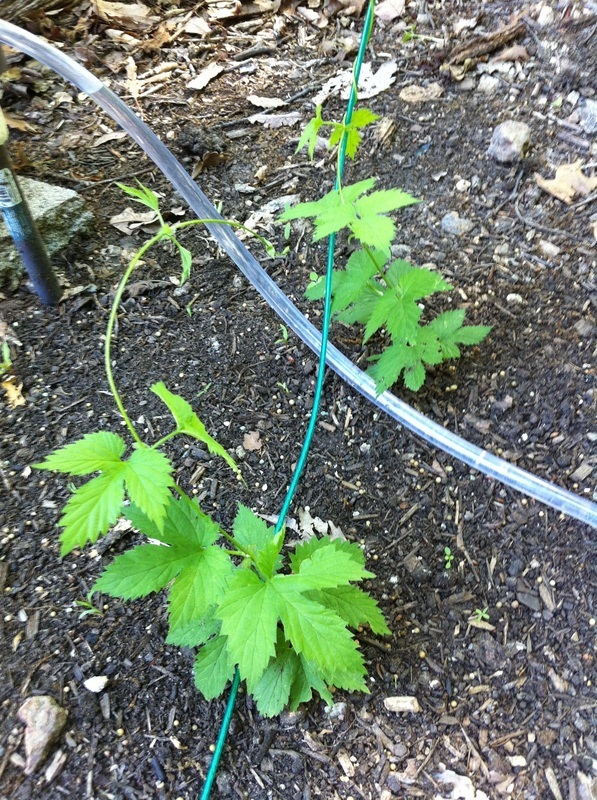 There were about 5 or 6 cones in September and it was nice to see some real hops. 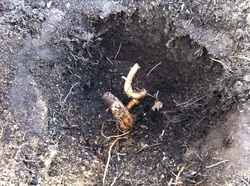 The first season is really about establishing the root system so next year should really sprout nicely. 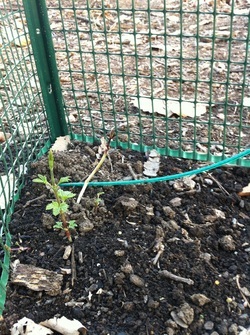 I let the hops go dormant and snipped the base. 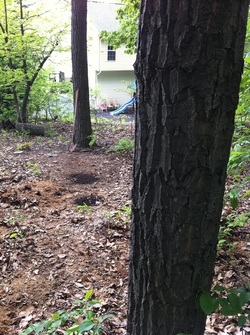 Extra soil with fertilizer was added to protect it during the winter. 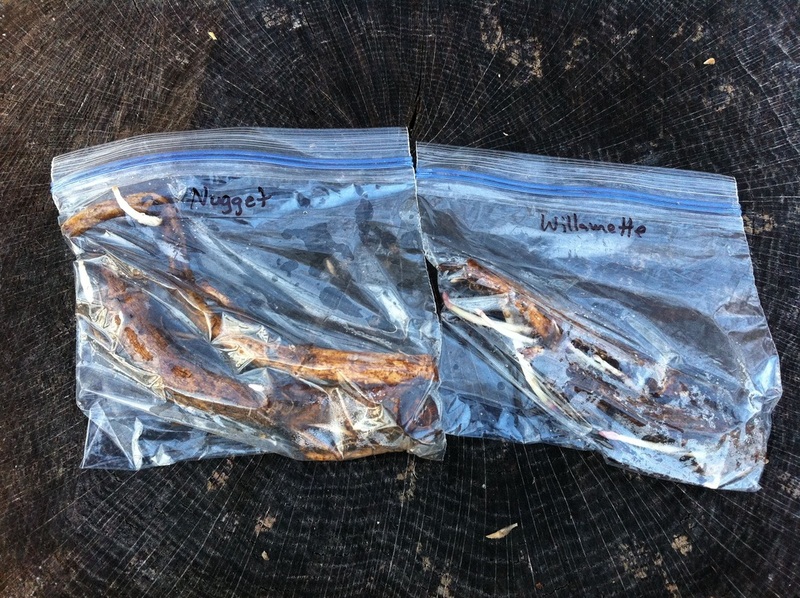 I'm planting two more varieties of hops this year including nugget and willamette. These should round out the group nicely. 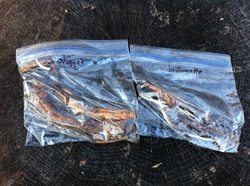 There are two rhizomes for each variety that will be planted together. If one doesn't take, then hopefully the other will. 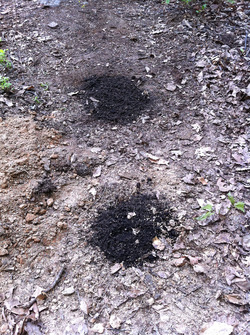 To begin, I dug two more holes, both about 1 foot deep. 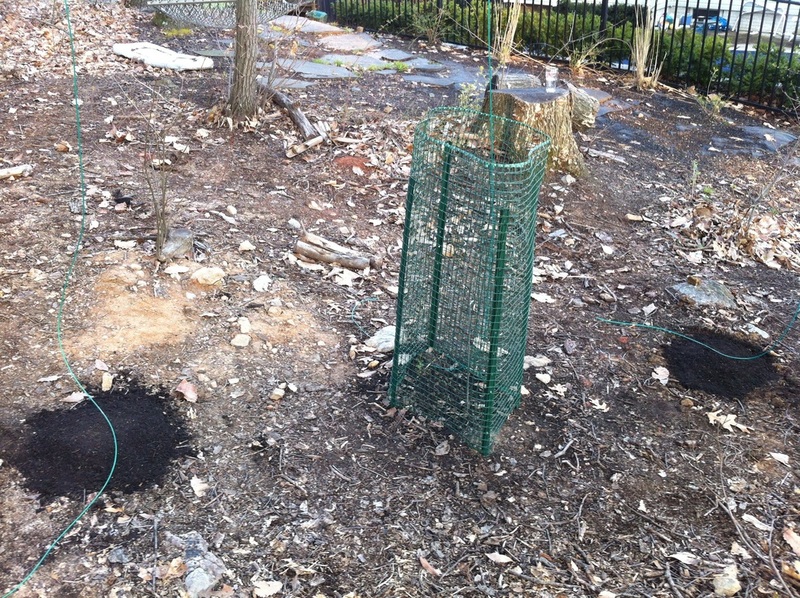 At the bottom, I made a nice soil bed and placed the rhizomes vertically with the shoots pointing toward the surface. 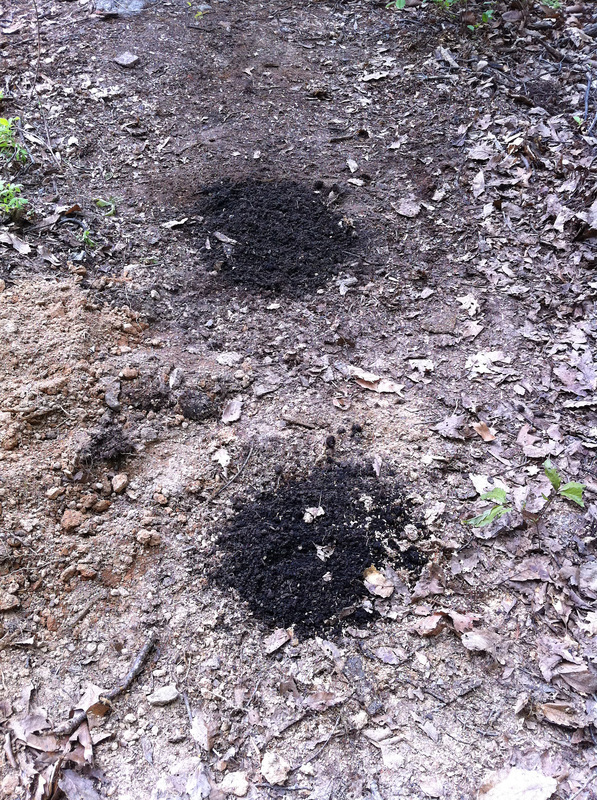 You want them around 2-3 inches from the surface. 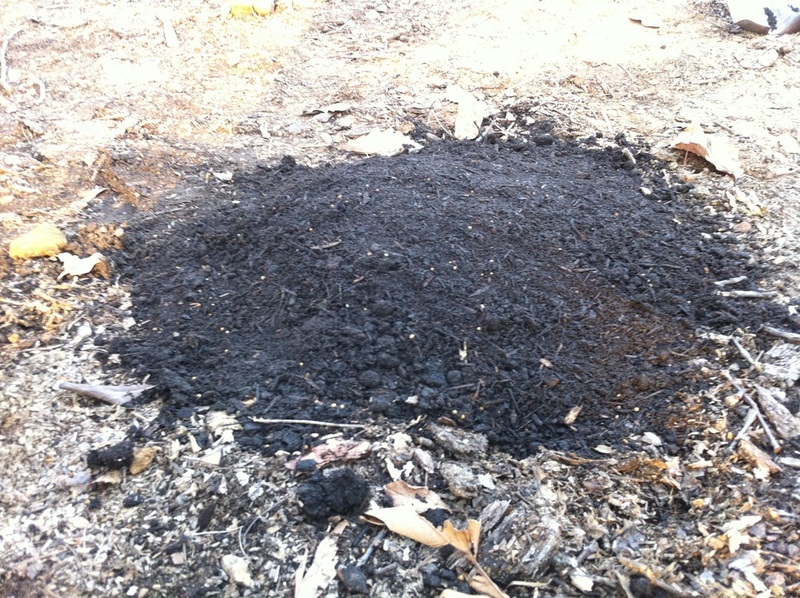 Make a nice mound so water rolls off. 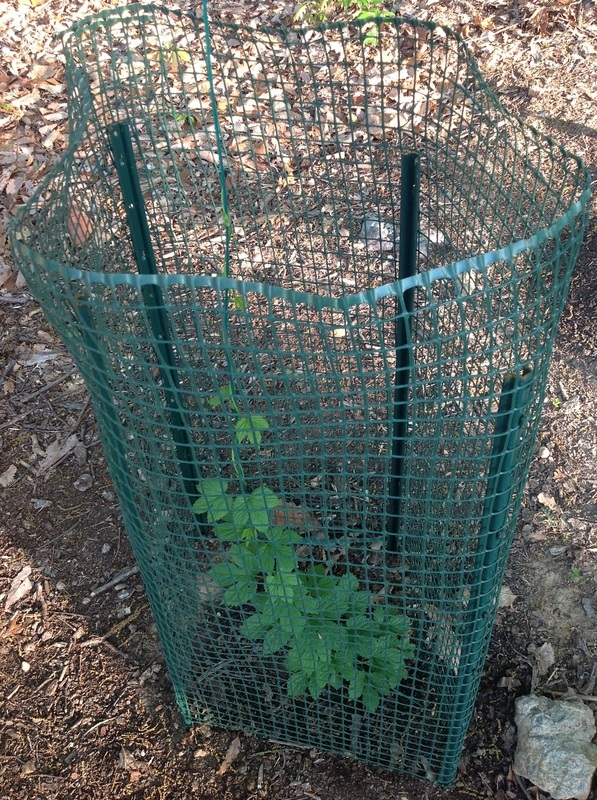 Because I had deer munch a few of the leaves last year, I decided to put up some protection for the cascade. I usually water every other morning for the first two months and then move to twice a week from there. 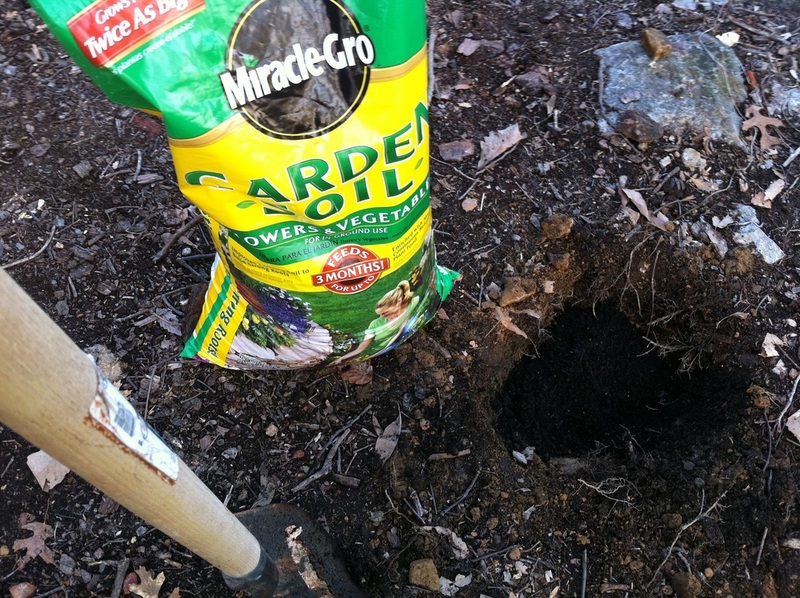 The soil should be moist, but not drenched. This is very important! 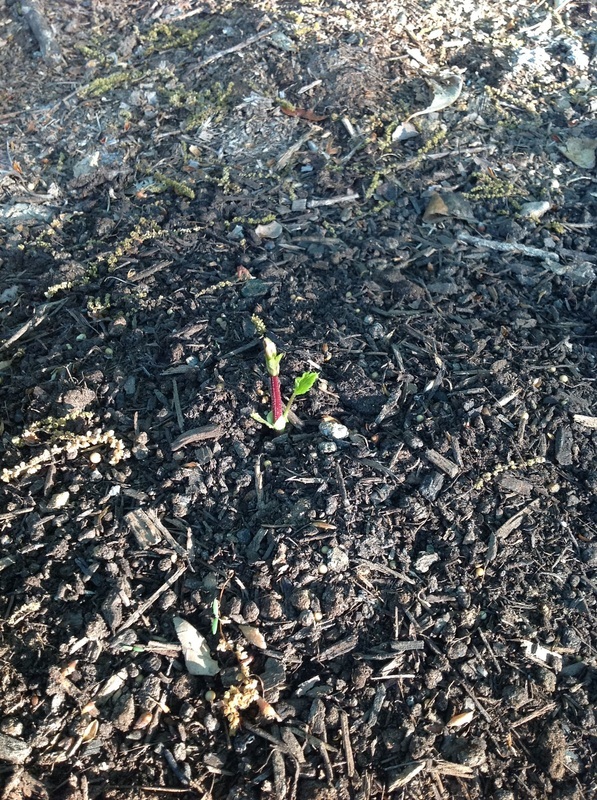 Look, we have some nice sprouts coming up! In the picture below, you can see the two I decided to cut, along with both bines that will be trained, and that one is significantly stronger than the other. Both have nice leaves early on which will help catch some much-needed sunlight. When cutting back shoots, I usually pull them up lightly to expose more before cutting. We've had some nice growth after another two weeks. 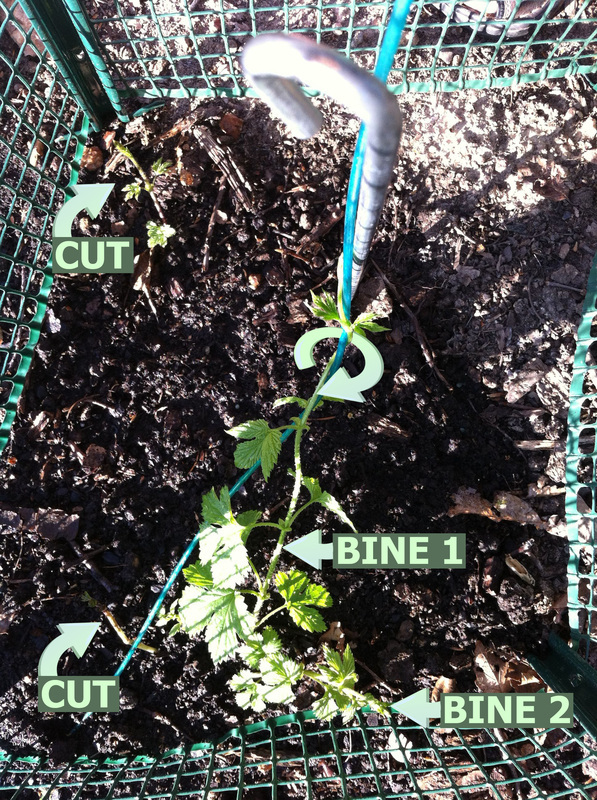 Bine 1 has climbed to around 3 feet tall and bine 2 is not far behind and has begun to spiral nicely as well. And look! 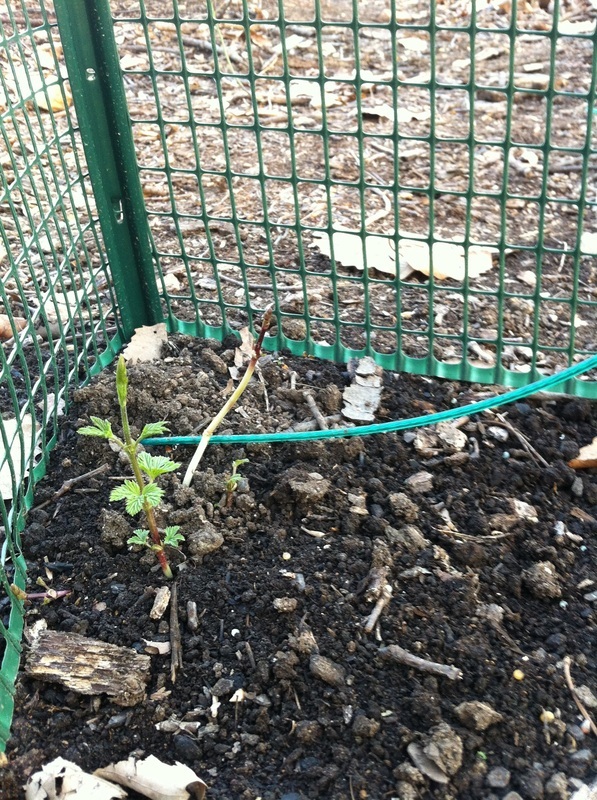 Finally, one of the newly planted hops nugget decides to poke his head out and say what's up. Hey there little feller! After almost a month, all three varieties seem to be doing very well. 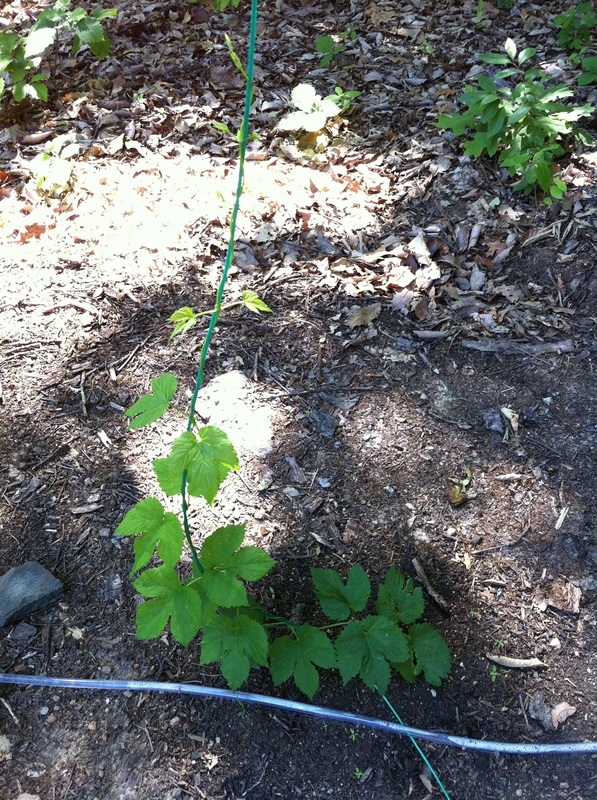 Willamette has sprouted and one of its bines grabbed the cable without any help at all! I'll cut back the extra bine soon so that all of the plants energy is focused on the root system and not supporting unnecessary growth. 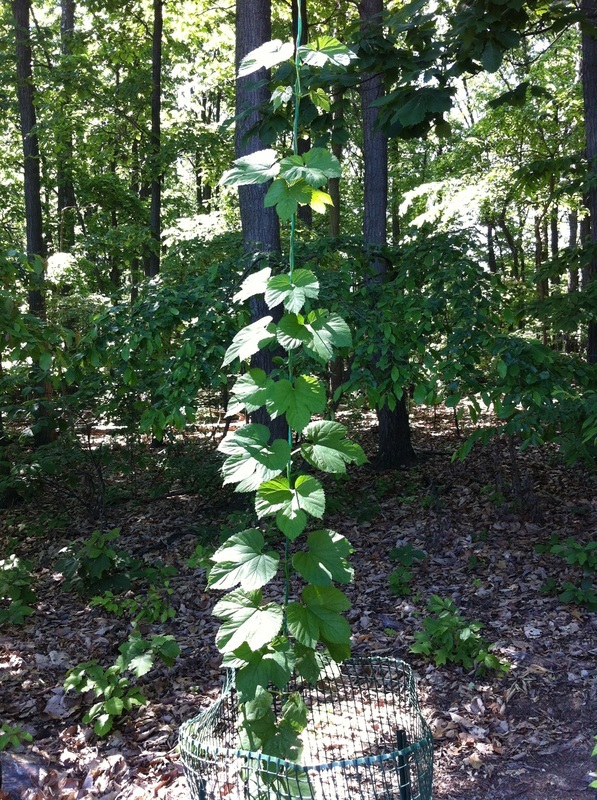 Cascade has grown twice it's height since our last update and is probably around 12-15 feet tall. This plant looks very healthy and I see no signs of aphids or mites on the backs of the leaves. The oldest leaves down in the first 1-2 feet do show signs that something munched them, but there are no signs of anything else. I should probably look into how to treat them organically in case I see more of this as we move later in the season. Here is a great PDF I found that shows different diseases to watch out for.